Laphi, Budget Magic lovers, it's that time once again! This week, we're heading to Modern to play a budget version of a tried-and-true archetype for older formats: Death and Taxes! While technically Death and Taxes is a White Weenie deck, unlike many White Weenie builds, rather than looking to play a ton of one-drops and kill the opponent as quickly as possible, Death and Taxes takes a slower route based on playing a ton of disruptive creatures that aren't powerful enough to lock the opponent out of the game but are annoying enough to slow the opponent down (hopefully enough to allow us to steal the win by beating down with our random creatures). Of course, building Death and Taxes on a budget means we are missing some key cards common in non-budget builds, like Aether Vial and some rare lands. Can Death and Taxes still annoy opponents out of the game without Aether Vial? Can a budget-friendly Death and Taxes build compete in Modern? Let's get to the video and find out; then, we'll talk more about the deck! Death and Taxes is basically a slower, more disruptive version of White Weenie, almost being a control deck that's filled with cheap white creatures. Like most White Weenie decks, while it does eventually win by beating down with a motley crew of creatures, rather than looking to be as aggressive as possible and win as quickly as possible, Death and Taxes looks to slow down the opponent with some strange, synergistic taxing effects and then win at its own somewhat leisurely pace. While we have a bunch of different annoying and taxing creatures, we kick things off with our spell-taxing effects. Since our deck only has four copies of Declaration in Stone as non-creature spells, both Thalia, Guardian of Thraben and Vryn Wingmare don't really hurt our game plan at all. On the other hand, most decks in Modern are playing some number of spells, and some popular decks (like Izzet Phoenix) are built around chaining together cheap spells, which makes Thalia, Guardian of Thraben and Vryn Wingmare two of the most important creatures in our deck. 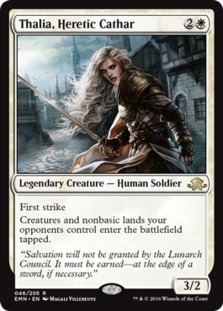 In general, Thalia, Guardian of Thraben is the better of the two since it comes down a turn earlier, but there is some upside (outside of budget) to playing a split of both since Thalia is legendary, so while we can never have two copies of Thalia, Guardian of Thraben on the battlefield, we can have one Thalia and one Vryn Wingmare. And all non-creature spells costing two more mana is devastating for a lot of Modern decks. 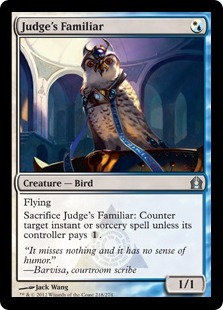 While not as powerful, in a lot of ways, Judge's Familiar is a one-mana version of Thalia, Guardian of Thraben since opponents tend to play off-curve to avoid having an instant or sorcery countered by our one-drop flier. Along with chipping in for some damage, the Bird combines well with Thalia, Guardian of Thraben and Vryn Wingmare to make it even more difficult for our opponent to resolve their spells. Even if we eventually need to sacrifice our Judge's Familiar, the fact that it only costs a single mana means we usually get value out of the card, even if it only sits on the battlefield for a few turns. What makes our spell taxers even better? Our opponent not having many lands on the battlefield, which makes it even harder for our opponent to cast spells through Thalia, Vryn Wingmare, and Judge's Familiar. 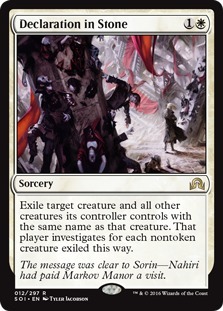 Here, our main plan is Leonin Arbiter, which is solid on its own by taxing fetch lands and other tutor effects (like Expedition Map from Tron, Primeval Titan from TitanShift, or Whir of Invention from Whir Prison) but gets even better in conjunction with Ghost Quarter and Field of Ruin. 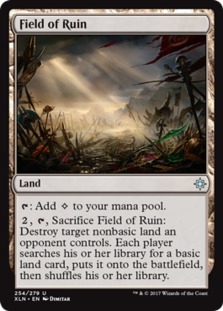 Normally, Ghost Quarter and Field of Ruin are ways to keep degenerate lands (like Tron) in check, but in conjunction with Leonin Arbiter, they turn into Modern-legal imitations of Strip Mine. 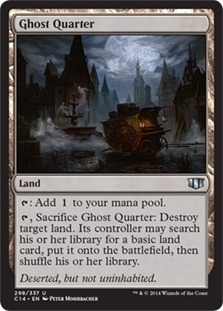 If we wait until our opponent is tapped down, we can use Ghost Quarter and Field of Ruin to straight-up destroy one of our opponent's lands since Leonin Arbiter's tax will keep our opponent from searching for a replacement. Combine this with the fact that our deck tops out at around three mana (so we don't need many lands on the battlefield to function), and both players going down a land generally is a good trade for us and is something game-ending when we can cut our opponent off of a color or if they stumble on drawing lands. Thalia, Heretic Cathar is just a one-of, but it offers some nice value, taxing both creatures and land. Making nonbasic lands come into play tapped has the potential to slow our opponent down by an entire turn if they have a handful of fetch lands and shock lands, which in turn helps to power up our other taxing pieces by limiting our opponent's mana. Meanwhile, forcing creatures to come into play tapped on our opponent's side of the battlefield does two things. First, it makes hasty creatures (like Arclight Phoenix) much less scary, since even though they have haste, they can't attack the turn they come into play. Second, it slows down our opponent's defenses since our opponent can't play a creature and immediately use it to block our motley crew of attackers. Toss this all together, and Thalia, Heretic Cathar is more than worth a one-of slot in our deck. While it doesn't tax one specific thing as much as our other cards, the fact that it hits on multiple axes helps make up for its lack of raw taxing power. While many or our taxing pieces make it hard for our opponent to get permanents on the battlefield, we also have some ways to deal with permanents that slip through the cracks. Our best combo here is Eldrazi Displacer and Mangara of Corondor. Separately, both cards are good, with Eldrazi Displacer getting blockers out of the way or blinking our own creatures for value or to save them from removal, and Mangara of Corondor is basically a slower creature version of Oblivion Ring. However, the power of these two cards combined makes them especially scary. Mangara of Corondor is formatted in a weird way. The cost of activating it is simply tapping the creature, which puts a trigger on the stack to exile a permanent of our choice and Mangara. This means that we can use Eldrazi Displacer's blink ability to save Mangara of Corondor with the exile trigger on the stack. Our opponent's permanent still gets exiled, and we still have a Mangara of Corondor, which allows us to use the synergy again the next turn to answer something else. 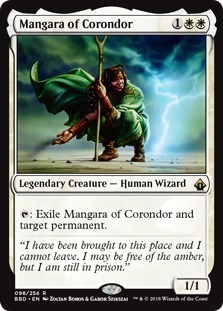 Toss in the fact that Mangara of Corondor can exile any permanent (including lands), and the lock can be devastating, especially combined with our other taxing effects. Apart from blinking Mangara of Corondor, we also have a backup blink plan. 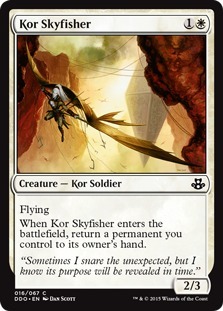 Kor Skyfisher is basically a backup, one-shot Eldrazi Displacer that also leaves behind a 2/3 flying body. 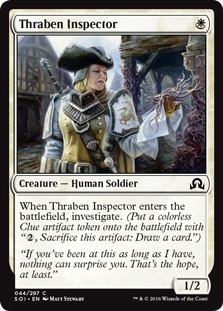 Meanwhile, Militia Bugler and Thraben Inspector give us steady sources of card advantage (in conjunction with Eldrazi Displacer) for when the game goes long, drawing us an extra card each turn, either by digging for a creature (in the case of Militia Bugler) or giving us a Clue token that we can turn into a card (in the case of Thraben Inspector). This card advantage helps us fight through removal and sweeper-heavy decks and makes sure that the next taxing effect is just around the corner. Our last two taxing creatures are Dryad Militant and Tithe Taker. While these cards aren't as central to the plan of our deck as the Thalias and Leonin Arbiters of the world, they do offer some nice value in certain matchups, combined with reasonable bodies. 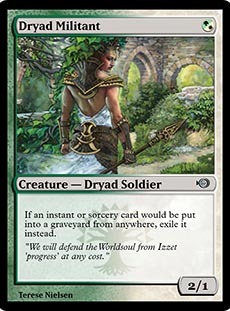 Dryad Militant basically eats any spell that goes to the graveyard from anywhere, which helps slow down Faithless Looting, Snapcaster Mage, and even Delve decks by giving our opponent fewer cards in the graveyard to delve away. Combine this with a Savannah Lions-esque body, and it's a solid taxing creature. Meanwhile, Tithe Taker is weird. It only taxes our opponent on our turn, which means it's mostly helpful against decks with counterspells and some instant-speed removal (like Settle the Wreckage). This makes Tithe Taker the least impactful taxer in our deck in most matchups. 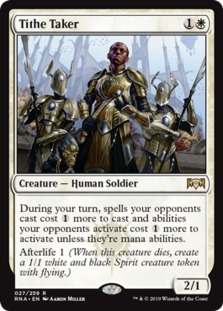 On the other hand, afterlife means that Tithe Taker is one of our best creatures in terms of its body, being a fine 2/1 on the front side and giving us a bit of resilience to removal by making a 1/1 flier once it dies. When it comes to closing out the game, our plan is to beat down with our random taxing creatures. The problem here is that most of our creatures aren't all that big, which means it often takes a few turns to actually kill our opponent. 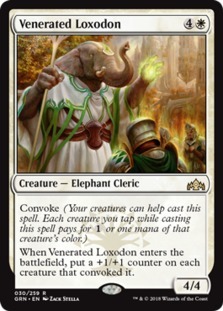 Venerated Loxodon helps speed up the process by convoking a counter onto up to five of our creatures (while also being a 4/4, often for zero or one mana, making it a sort of slow Hollow One). This means that Venerated Loxodon can add up to nine power and toughness to the battlefield for free, which is a pretty insane deal, even in a powerful format like Modern. While Death and Taxes tries to do pretty much everything with creatures to avoid hurting ourselves with Thalia, Guardian of Thraben and Vryn Wingmare, we do have one playset of a removal spell in Declaration in Stone. This is basically a budget choice. Path to Exile is the optimal removal for the deck (especially since we can sometimes eliminate the downside of giving our opponent a land with Leonin Arbiter), but Declaration in Stone is a fine budget replacement with some upside against token decks since it exiles all copies of a creature. Sometimes, we really need to get a big Death's Shadow or Eldrazi off the battlefield, and while two mana is a bit expensive, Declaration in Stone gets the job done. All in all, we played five matches with Mono-White Taxes and won three, which is pretty decent for a $93 deck in Modern. Oddly, our losses had one thing in common: they were both Arbor Elf / Utopia Sprawl decks, which seems like really difficult matchups for Mono-White Taxes since our opponents can make so much mana that our Thalia, Guardian of Thraben and Vryn Wingmare aren't all that effective. That said, we only lost to Ponza because of Stormbreath Dragon's protection from white (combined with the fact that we probably needed to attack into it more aggressively). So even though the Arbor Elf decks felt like bad matchups, they didn't feel completely unwinnable. As far as changes to make to the budget build of Mono-White Taxes, I'm actually pretty happy with how the deck turned out. Our taxing effects were very effective in most matchups, and Venerated Loxodon was a surprisingly solid way to close out the game. As such, if the goal is to not increase the budget, I'd probably keep the deck exactly as is. On the other hand, if you are willing to increase the budget just a little bit, playing Path to Exile over Declaration in Stone would represent a big improvement (plus, if you're getting into Modern, Path to Exile is a card you want in your collection anyway since it's a true staple of the format). In the end, Mono-White Taxes felt like a really solid budget option in its current form, and it has a ton of upgrade potential into a legitimate second- or third-tier deck like Eldrazi and Taxes or GW Taxes. If you like annoying your opponent but locking them out of the game completely with Blood Moon, Chalice of the Void, and Ensnaring Bridge is a bridge too far, this might be the perfect budget deck for you! 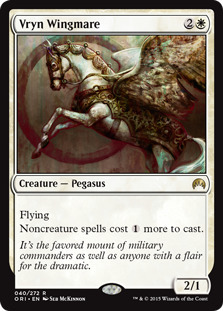 It also seems like one of the better budget White Weenie decks for Modern. I've tried a bunch of more aggressive White Weenie decks, and they usually end up getting crushed by removal and sweeper-heavy decks (or flood out and play poorly). Mono-White Taxes maintains the White Weenie play style but offers a lot more card advantage and resilience thanks to the taxing effects. So if you want a budget White Weenie deck for Modern, this is probably the way to go. 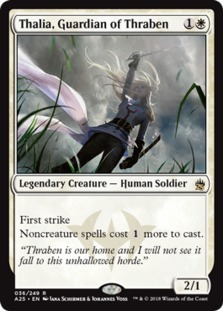 The ultra-budget build of Mono-White Taxes gets one massive loss: Thalia, Guardian of Thraben. At over $10 a copy, there just isn't a way to make a $50 deck that plays the legend. As such, we have to work around this downside, going up to four copies of the much cheaper (but much slower) Vryn Wingmare and some more Dryad Militants to facilitate faster starts. 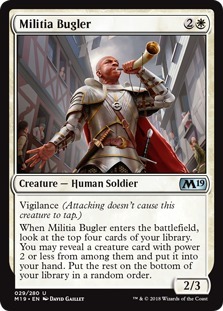 Otherwise, we turn Field of Ruin into Tectonic Edge and Tithe Taker into more copies of Militia Bugler and change up the sideboard slightly. Honestly, I wouldn't want to play the ultra-budget build in a competitive environment. Thalia, Guardian of Thraben might be the most important card to the deck, so trying to play without it is a risky strategy. While this deck could be good for practicing while you save up for your copies of Thalia, Guardian of Thraben, I wouldn't expect to be super competitive without the two-drop. One of the upsides of starting with the budget build of Mono-White Taxes is that there are several different tier decks you can build toward from the budget foundation, depending on your personal tastes. The highest-tier options are the Eldrazi and Taxes builds, which combine our mono-white shell with the colorless power of cards like Thought-Knot Seer and Reality Smasher as disruptive, powerful finishers. Meanwhile, the last deck above is the most similar to the build we played in the videos. While it still has Eldrazi, it keeps the mono-white shell and even plays the Eldrazi Displacer / Mangara of Corondor combo! Any of these options are more than powerful enough to compete at an FNM or even the Grand Prix level, so the build you choose is mostly about which style you like the most and how much you're willing to spend.